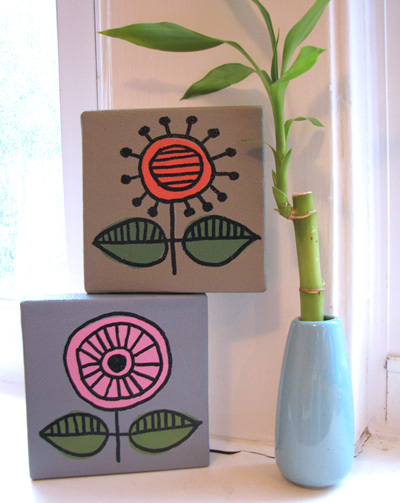 Some little retro drawings on canvas. I wonder how high I could stack them. Hey, if these were blocks, that would be fun. Except babies would probably chew the paint off. Scratch that. The whole picture is great, love that baby blue vase! They are very cute. And you could stack them in a baby's room- where they couldn't be reached and chewed on ,of course. You know, Martha did athing on making handmade baby blocks with mod podge over the paint...do you think thats safe? Great idea...very simple and retro looking! Same one, Mum. I can't believe it's not dead. Adorable... nice little bamboo plant too. What kind of pen did you use to draw on the canvas? Do you have any suggestions for a type of white pen that draws well on canvas? The white paint pen I have only worked for about 1 minute. Ugh. hi! is the black done with a brush? I can't ever seem to get a smooth line with a brush. I bow to your prowess. even if it wasn't a brush. oh I love this- thank you for the inspiration! I used a DecoColor paint pen. Jennie, I tried their white one before and it worked fine the first time, but the last time I tried to use it, it was all watery and weird. The black works great, though. Don't know why. these are great and I like the idea of stacking/moving them around rather than committing to a space on the wall..(I never get round to hanging pictures!- the next line of inspiration is always round the corner!). Enjoying your blog for all your helpful tips. How about embroidering the designs on softie blocks?